ROSSBURG, Ohio - July 14, 2016 - David Gravel had his hands full through much of Thursday night's inaugural Jokers Wild at Eldora Speedway, but the 24-year-old driver held tough and scored his fourth World of Outlaws Craftsman Sprint Car Series victory of the season. "It's awesome. It's pretty friggin' surreal," Gravel said in victory lane. The 24-year-old driver kicked off his dominant run by powering past Donny Schatz in the Dash to take the feature pole position. Through the opening laps of the 30-lap main event, Gravel pulled out to a steady lead over second place Brian Brown. Through early cautions the field tightened back up. NASCAR Truck Series stand out and two-time World of Outlaws winner Christopher Bell, who started fourth, powered forward, slipped back and then again made the charge to the front. He had taken over the second spot with the leader in his sights when the caution flew and Bell was forced to the pits with a mechanical issue. On the restart, Gravel had his hands full with Schatz who looked for a way around the No. 5 Big Game Treestands car. Schatz slid through turns one and two but Gravel held him off. Through three and four, Schatz again slid through the corner and the two crossed each other down the front. Gravel still held the lead. Through the middle of the feature, the fight for third and fourth heated up as Kerry Madsen worked to hold on to the final podium position and Logan Schuchart and Rico Abreu fought to take it away. Schuchart looked to have a chance but Abreu powered forward on a late restart and with a slider, took over third. As the laps ticked away, the leaders, Gravel, Schatz and Abreu spread out. That did not last long though as Gravel worked his way through traffic in the final 10 laps, Schatz closed the distance and began looking for a line around. "Lapped traffic really slowed me down," Gravel said. "I just tried to keep my pace up. I slid (Randy) Hannagan and I know I lost all my speed there." Schatz continued the assault through the remaining six laps, getting his No. 15 Bad Boy Off Road/Chevrolet Performance car side-by-side with Gravel but Gravel held on. On lap 28, as the white flag flew signaling the final lap, Schatz gave it one last chance. Staying close off of turn two, Schatz slid Gravel through three and four and nearly got around him, but Gravel powered his CJB Motorsports car across the line. Just .03 seconds separated first and second. "Donny made me get my elbows up there," Gravel said. "I had to run the top of three and four there and keep my speed up. We got a power steering leak - the power steering was going away and I was getting tired there at the end with my power steering going away. "I can't thank my team enough - Derek, Barry and Austin. Chad and Jenn Clemens put me in this car. It's been a great season - we've had three bad nights all year. We were good here last time, we tried something a little different and won here tonight. Hopefully we can carry that on all weekend." Schatz said he thought he had his opportunity at the end of the feature. "That last corner there I thought we would be able to clear (Gravel) but I didn't use him up - I tried to do the right thing coming to the checkered." "These guys did an awesome job - it's consistent, it's balanced, so the next couple of nights we'll have a chance." For Abreu, Eldora has been a place of consistent improvement for him and his No. 24 Abreu Vineyards team. Abreu said the momentum and the seat time would help as they went through the Kings Royal weekend and the upcoming NASCAR truck series race. "It's good, you've got to keep plugging away. We're right there. It's just one position, one restart away from winning. Really good restarts, really good racecars," Abreu said. "We've got a lot of racing with two more and then the truck race and this track is already badass." Greg Wilson was the night's KSE Racing Hard Charger, advancing 14 positions to finish in 10th. Kerry Madsen picked up his first quick time award of the season after turning a lap of 13.488 seconds. The World of Outlaws Craftsman Sprint Car Series returns to Eldora Speedway Friday night for the Knight Before the Kings Royal. For more information and to learn how to purchase tickets, visit WoOSprint.com/Knight-Before-the-Kings-Royal. 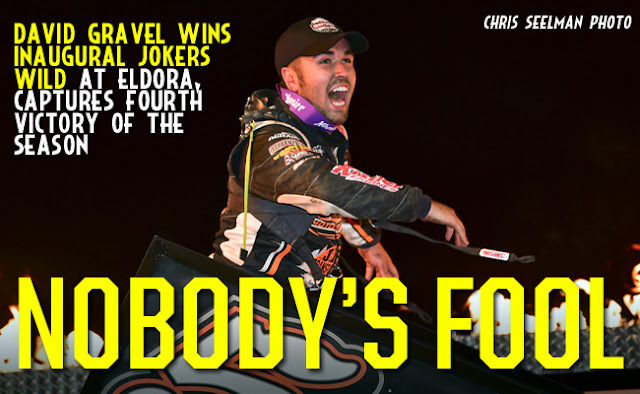 RACE NOTES: David Gravel's win tonight was his fourth World of Outlaws Craftsman Sprint Car Series victory of the season and his first ever at Eldora Speedway… Greg Wilson was the night's KSE Racing Hard Charger, advancing 14 positions to finish in 10th… Kerry Madsen picked up his first quick time of the season with a lap of 13.488 seconds around the half-mile track… Tonight's Jokers Wild was the first ever running of the event at Eldora Speedway. CONTINGENCY WINNERS - MSD Ignitions ($25 cash): Brent Marks; MSD Ignitions ($50 cash): David Gravel; Penske Shocks ($50 cash): Donny Schatz; JE Pistons ($50 cash): Logan Schuchart; VP Racing Fuels ($50 cash): Chad Kemenah; Edelbrock ($50 cash): Daryn Pittman; Comp Cams ($50 cash): Greg Wilson; Morton Buildings ($50 cash): Jason Johnson; Cometic Gasket ($50 cash): Shane Stewart; Super Flow ($50 cash): Brad Sweet; Craftsman/Sears ($100 cash): Brian Brown; KSE Racing Products ($100 product certificate): Greg Wilson; Comp Cams ($50 product certificate): David Gravel; JE Pistons (Set of Rings): Brent Marks; JE Pistons (Set of Rings): N/A. SEASON WINNERS: Donny Schatz - 14 (Volusia Speedway Park on Feb. 14, The Dirt Track at Las Vegas on March 4, Stockton Dirt Track on March 18, Stockton Dirt Track on March 19, Silver Dollar Speedway on April 2, Lincoln Speedway on May 19, Weedsport Speedway on May 22, Lincoln Park Speedway on June 8, Knoxville Raceway on June 11, River Cities Speedway on June 17, Rockford Speedway on June 29, Badlands Motor Speedway on July 3, Cedar Lake Speedway on July 9, Attica Raceway Park on July 12); Brad Sweet - 7 (Volusia Speedway Park on Feb. 13, Volusia Speedway Park on Feb. 14, Cotton Bowl Speedway on Feb. 26, Ocean Speedway on April 1, Bakersfield Speedway on April 15, Plymouth Speedway on May 13, Badlands Motor Speedway on July 2); Daryn Pittman - 5 (Royal Purple Raceway on Feb. 27, Perris Auto Speedway on April 16, USA Raceway on April 18, New Egypt Speedway on May 24, Jackson Motorplex on June 24); Shane Stewart - 5 (Arizona Speedway on March 6, Devil's Bowl Speedway on April 23, Lawrenceburg Speedway on May 30, Granite City Speedway on June 15, Brown County Speedway on June 19); David Gravel - 4 (Thunderbowl Raceway on March 12, Tri-State Speedway on May 14, I-96 Speedway on June 6, Eldora Speedway on July 14); Joey Saldana - 4 (The Dirt Track at Las Vegas on March 3, Devil's Bowl Speedway on April 22, Jacksonville Speedway on May 4, I-80 Speedway on June 22); Kerry Madsen - 2 (Eldora Speedway on May 6 and 7);Bill Balog - 1 (Beaver Dam Raceway on June 25); Lance Dewease - 1 (Williams Grove Speedway on May 20);Chad Kemenah - 1 (Fremont Speedway on June 3); Jason Johnson - 1 (Placerville Speedway on March 24);Terry McCarl - 1 (Knoxville Raceway on June 10); Logan Schuchart - 1 (Cedar Lake Speedway on July 9); Jason Sides - 1 (I-30 Speedway on April 26); Greg Wilson - 1 (The Dirt Track at Charlotte on May 27). World of Outlaws Craftsman® Sprint Car Series Statistical Report; Eldora Speedway; Rossburg, Ohio; July 14, 2016.